Actor Terrence Howard was arrested in August 2000 after causing a disturbance on an airplane. Howard allegedly assaulted a Continental Airlines flight attendant after refusing her request to return to his seat because the seat belt sign was on (the actor, cops said, grabbed the flight attendant by the wrist and tried to push her). 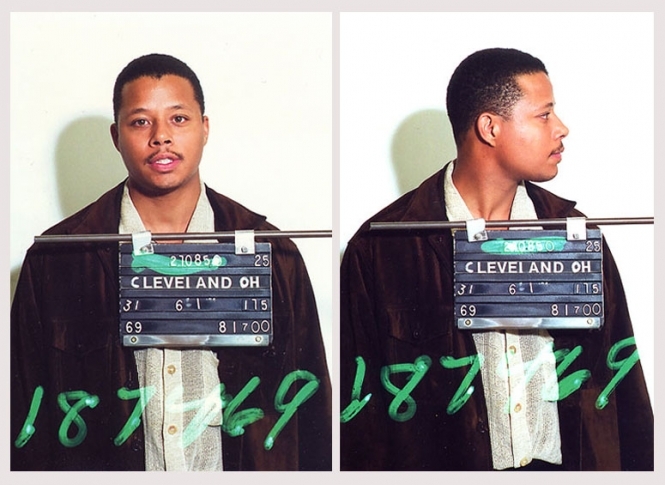 Howard was arrested when the flight landed in Cleveland, where he posed for the above Cleveland Division of Police mug shot. The misdemeanor rap against him was subsequently dropped by a local prosecutor for lack of jurisdiction. Submitted by SpecialEd on Thu, 2011-06-02 21:56. Submitted by Midknight on Thu, 2011-05-12 04:58. He was damned lucky on that one! Submitted by greeble on Mon, 2010-09-06 19:58. Nah. Not in 2000. Just one more self-important celebrity back then. Submitted by Shelly Shores on Tue, 2010-08-31 04:52. If it were anyone else, they would have gotten charged with terrorism!! !